Home » » GROWTH OF THE MALAYSIA’S ECONOMY UNDER 3 PRIME MINISTERS: WHICH ERA IS BETTER? 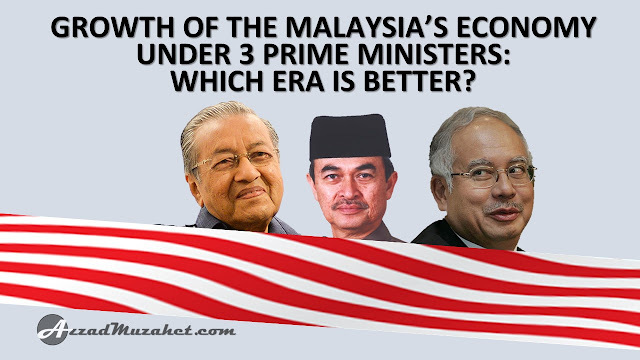 GROWTH OF THE MALAYSIA’S ECONOMY UNDER 3 PRIME MINISTERS: WHICH ERA IS BETTER? Malaysia is a free-market economy. The nature of openness in free market system implies that Malaysia's economic growth is not only determined by domestic development policies but also influenced by the global environment. This is the challenge faced by national leaders in steering Malaysia's economic development over the past 30 years under the leadership of the 3 Prime Ministers. Tun Mahathir Mohamad led Malaysia, as the 4th Prime Minister from 16 July 1981 to 31 October 2003. He was replaced by Tun Abdullah Ahmad Badawi, as the 5th Prime Minister for the period from 31 October 2003 to 3 April 2009. Datuk Seri Mohd Najib Tun Abdul Razak takes over as the 6th Prime Minister from 3 April 2009 to 9 May 2018. Beginning May 10, 2018, Tun Mahathir Mohamad once again spearhead Malaysia, as the 7th Prime Minister after he won the 14th General Election under the Pakatan Rakyat’s party. During the first 10 years as the Prime Minister, since 1981, the country's economic growth rose from an average of 5.0% in 1970s to an average of 7.4% in 1980s (see Diagram 1). The country's economic growth continued to increase in 1990s and reached 10.0% in 1996 – the highest growth recorded in the Malaysian history for the last 30 years. The Asian Financial Crisis took place in 1997/98 following the currency attack that nearly collapses the financial system in the Asian countries, pioneered by currency speculator, George Soros. Malaysia was able to withstand 7.3% growth in 1997 but the country's economic growth continued to fall to -7.4% in 1998. The drastic actions taken through the National Economic Action Council (NEAC) had saved the country's financial system and the country's economic growth had recovered to a positive level of 6.1%, in just one year in 1999 and 8.9% in 2000. As mentioned above, as a free market economy, Malaysia's economic growth is also influenced by the global environment. In September 11, 2001, two jet airliners hijacked by al-Qaeda terrorists destroyed the World Trade Center in the United States. The American economy slowed down and the effects spread throughout the world. Malaysia was able to withstand low positive growth of 0.6% and increased in the following year to 5.4%. Once again in 2003, the country's economy affected by the global environmental following the Iraq War and the Severe Acute Respiratory Syndrome (SARS) epidemic that became the root-cause of the global economic slowdown. 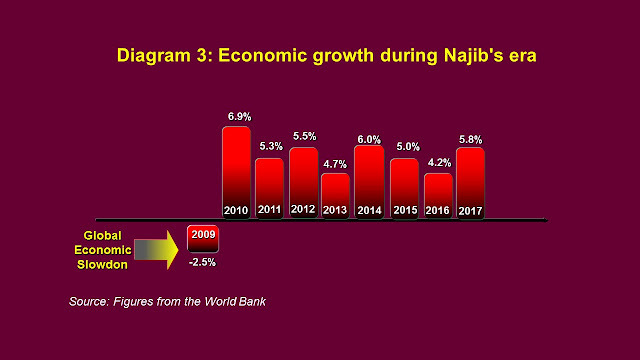 However, the country managed to maintain a positive growth at 5.8% level until Tun Mahathir stepped down as Prime Minister on 31 October 2003. 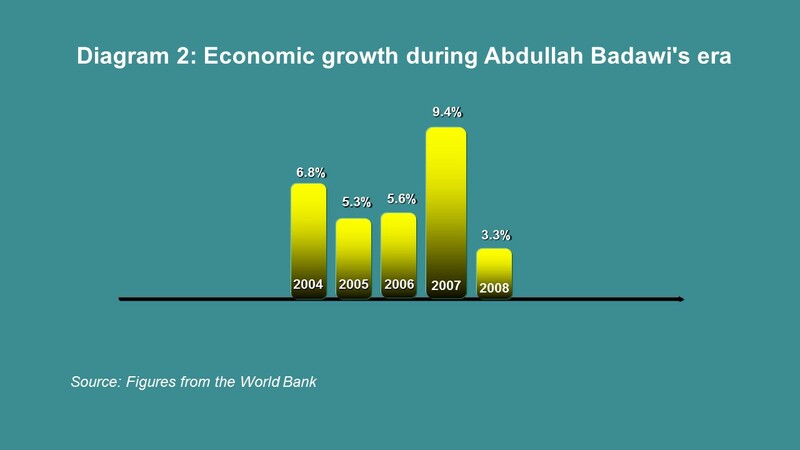 When he became the Prime Minister on October 31, 2003, Abdullah Badawi inherited a strong economic growth from the previous era. In 2004 the economy grew at 6.8% but decreased in the following years at 5.3% (2005) and 5.6% (2006) - see Diagram 2. The country's economy recorded a high growth of 9.4% in 2007 before declined to a low growth of 3.3% in 2008, following the downturn in the world economy during the year. The short period of service and lack of interest in national economic management explained the unfavorable country’s economic growth position during 2004 to 2008, until he ended his service on 3 April 2009. Najib became the 6th Prime Minister on 3 April 2009. At the beginning of his service, the country's economy was facing the impacts of global economic slowdown that began in 2008. In 2009, the country's economy recorded a negative growth of -2.5% but turned to a positive growth of 6.9% in 2010 (see Diagram 3). This relatively high growth was due to low (negative) base year figures in 2009, where with a slight increase will push the percentage higher. The global economic situation for the following 8 years period (2010 - 2017) was stable. 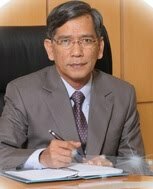 However, the stability of the world economy during that period was not exploited by Malaysia to achieve higher economic growth. The country only managed to achieve moderate growth within the range of 4.0% to 6%. The 1980s and 1990s had witnessed the achievement of the country’s high growth performance. 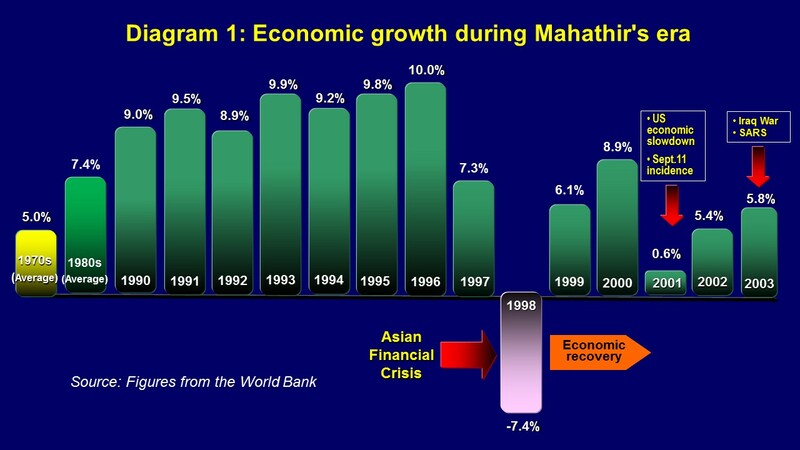 The highest growth recorded at 10.0% in 1996, a record high in the history of Malaysia's economy for the past 30 years. Despite challenges from global environment in the following years, the country managed to recover its economy very well. However, the period of 2010 - 2017, 8 years after global economic downturn in 2009, the country’s growth performance seems relatively low for quite a long period, hovering the range between 4.0% to 6%. The slow growth for the period reveals the absence of pragmatic measures to realign the economy back to its original path. Which era is better? You answer yourself.